I had this plan for some time now: Providing a list with links to HP drivers and firmware downloads and useful documents for VMware ESX(i). Why? Because it is so hard to find this stuff on the HP pages ... Currently they are revamping their web pages, and I thought maybe this is getting better now, and that they would finally begin to provide their downloads in a well structured way making it easy to find the stuff again and link to it. But they didn't - it looks like they are just changing the layout of the web pages and are trying to break their own ridiculous world record for the longest URLs. Okay, enough grumbling. Here is the list. Of course it is far from complete and mainly covers the hardware that I'm using myself (that makes sure that I will keep it up to date), but I believe that everyone using VMware on HP hardware will find it useful. One reason why I consider virtual servers to be superior to physical servers is that you have advanced hypervisor based technologies and functionalities available that let you manage virtual servers more efficiently. A good example for this is doing backups. PHD Virtual was among the first to provide a virtualization specific backup solution. They use a Virtual Appliance approach without the need for physical hardware and make use of VMware's Change Block Tracking (CBT) feature to enable efficient block level incremental backups. Their backup product has evolved since 2006 and is now available as PHD Virtual Backup and Replication v5.4. It is compatible with VMware vSphere 4.1 and 5.0 (I used both for testing) and also works with Citrix XenServer. The main engine of the product is a Linux based Virtual Appliance that is deployed to the virtualization hosts that also run the virtual machines that are to be backed up. For easy scale-up you can have multiple copies of such Virtual Backup Appliances (VBA). They connect to a single ESX(i) host or to a vCenter server managing multiple hosts. For backing up a VM the VBA first creates a snapshot for it through this connection. Creating a snapshot means that each virtual hard disk of the VM will be frozen into a read-only base disk, and all changes to the disk (done by the guest OS) will be recorded in an extra delta file. The VBA will then hot-add the read-only base disk to itself and do a block level backup of it to a backup store. 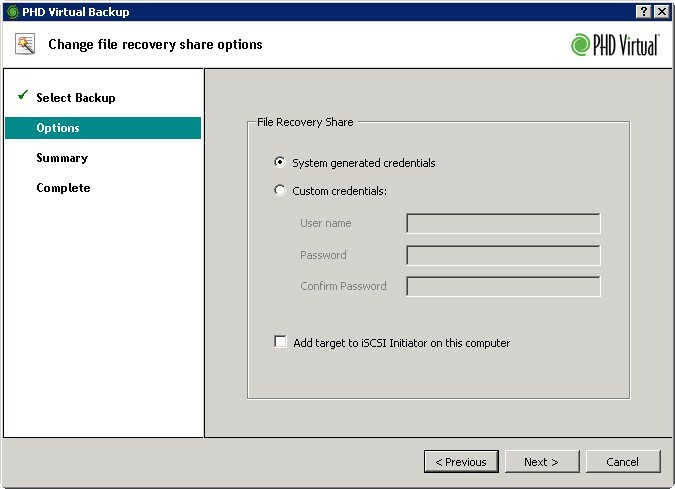 The backup store can be a locally attached virtual disk or a network share that was exported via CIFS or NFS. The very first backup will copy all blocks of the disk, but to minimize the overall backup data and time the VBA will use smart deduplication and compression algorithms. For subsequent backups of the same disk you can make use of CBT, and that means that only the blocks that were changed or added since the last backup will be stored. Every backup is a full backup though, because the unchanged blocks are also linked into each new backup set. This strategy is also known as incremental forever. Together with the applied deduplication and compression this is probably the most efficient backup method that you can implement these days. After all (changed) blocks have been backed up the VBA will hot-remove the disk again from itself, and - as a last step - initiate the deletion of the VM's snapshot. Needless to say the VBA will of course also save the VM's configuration, so that it can later be completely re-created and restored from the backup set. One promise that PHD Virtual does for its product is that you can have it up and running in 5 minutes. So, how long did it take me? Well, in fact it was less than 5 minutes! The software download includes the VBA in OVF format and a Windows based management console software. In a minute I imported the appliance to the vCenter server of my test environment, it's ~800 MB in size and inflates to 8 GB if thick provisioned. Before powering it on I attached an additional 100 GB disk to the VBA that I planned to use as backup storage. When powered on the VBA configured its network through DHCP (manually setting an IP address is also possible on the console). While the import was running I also installed the management software on my workstation. A typical Windows setup wizard did the job with five mouse clicks and left me no chance to make a mistake. Time sync through NTP should be properly set up in this dialog to ensure correct handling of backup schedules and time stamping of backup sets! The Hypervisor Credentials will be used by the VBA to connect to the vCenter server (or to a single ESX host). The number of Data Streams (i.e. 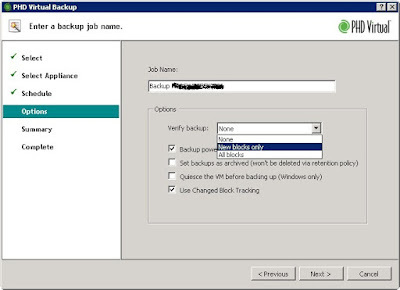 the maximum number of simultaneous backup and restore jobs) is limited to 4 in the Trial version. In the Enterprise version the maximum is 8. I selected the Attached Virtual Disk as Backup Storage Type in the next tab. Other choices are a NFS or CIFS share. By using local disks you can implement a LAN free backup eliminating any possible network bottlenecks. Backup data is compressed by default, but this option is also configurable here. Backup Retention: lets you define how long you want to keep backup sets. Out-dated sets will be automatically deleted to save backup storage space. At the beginning of this post I already explained how the backup process works technically. Scheduling it is easy with the management console: Obviously the first step is to select the VM(s) to back up. 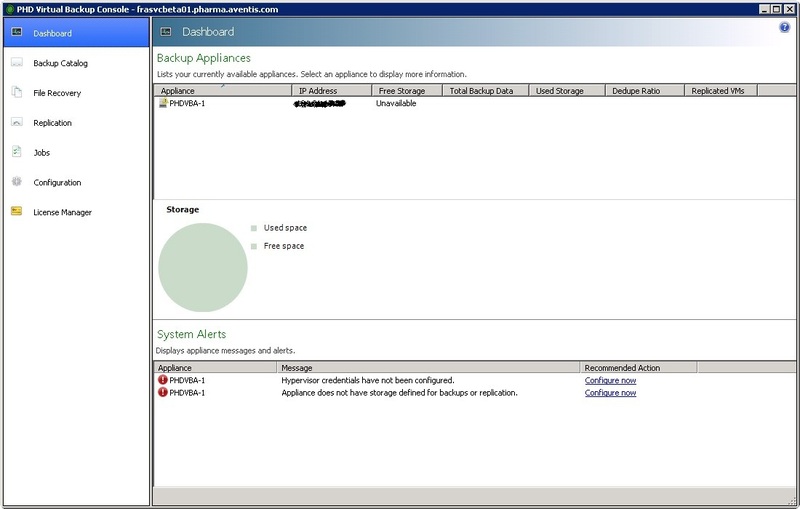 You can pick individual VMs here or a complete VM folder from the vCenter inventory view. If you schedule a job for a folder then it will also automatically apply to any VMs that are added later to this folder - a nice way to implement a "set and forget" backup schedule. In both places you can also see statistics about how much data was backed up, how much was actually written, and the deduplication ratio. I was very much pleased with the speed of the differential backups using CBT. Backing up a VM this way would often take only a couple of minutes. If you are not satisfied with the speed of backups one thing to check is the CPU and memory load of the VBA(s). By default they have minimum resources (1 vCPU and 1 GB RAM) - upgrading them with more CPUs and RAM can significantly improve their throughput. Backups are boring, Restores are exciting?! When using traditional backup methods (with an agent running inside the guest OS and doing a file level backup) restoring a machine can be a time-consuming and thrilling experience. In this case a restore can be an error-prone process that needs to be carefully tested for each OS version and special applications like SQL that need special agents. With the image based backup approach that PHD Virtual is using this is somewhat different. Usually you do not need to worry about a restored machine not being bootable, the OS will always be in a consistent state. If the applications that runs inside the VM benefit from the pre-snapshot Windows VSS quiescing (mentioned above) then they will also be in a consistent state after recovery. However, not all applications support this - if in doubt ask your vendor and do backup/restore tests to safeguard yourself from unpleasant surprises. Network Settings: The default is to use network settings from the backup. If the original VM is still around you may change the MAC address of the restored VM to avoid any conflicts. Finally you must choose a virtual port group to attach the restored VM to (Distributed Virtual Switches are also fully supported). Once the restore job is started the VBA will recreate the VMs with the original configuration plus the selected restore settings, and their virtual disks will be filled with the backup data. You might run into situations where you don't want a VM to be completely restored, but only some of its files or application records (e.g. for restoring files from a virtual file server or single mailbox items from a virtual Exchange server). This is also possible with PHD Virtual Backup, and it uses a quite unique approach to accomplish this. In the Options dialog you can define a custom CHAP secret for mounting the iSCSI target (or accept system generated credentials). 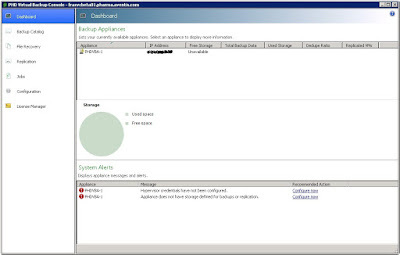 If you check the Add target to iSCSI initiator on this computer option then this will automatically mount the iSCSI target on the Windows machine that runs the Backup Console. A prerequisite for this is an installed iSCSI initiator. Since Windows 2008 an iSCSI initiator is included in Windows, for earlier versions of Windows it is available as a free download from Microsoft. The Restore iSCSI target can be mounted from an arbitrary computer (iSCSI initiators are available not only for Windows, but literally every Guest OS including Linux) by specifying the VBA's IP address for iSCSI discovery and the defined CHAP secrets for mounting the target. The big advantage of this method is that the original virtual disk can be mounted directly from the backup as a block device - that means it will appear in the same way as the original disk, but with the data of the selected backup set. This way File Level Restore (FLR) is completely Guest OS and file system agnostic. This unique FLR method enables not only a straightforward single file restore, but also interesting opportunities for seamless application item restore. On the PHD Virtual web site you can watch videos that demo e.g. the restore of a single SQL server table and a granular Exchange item recovery. 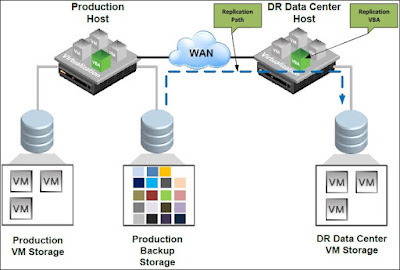 The latter means that multiple VBAs can share a backup storage as a replication source. 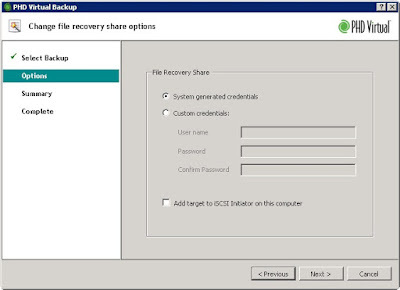 An easy way to accomplish this is to export the local backup storage of one VBA through CIFS. 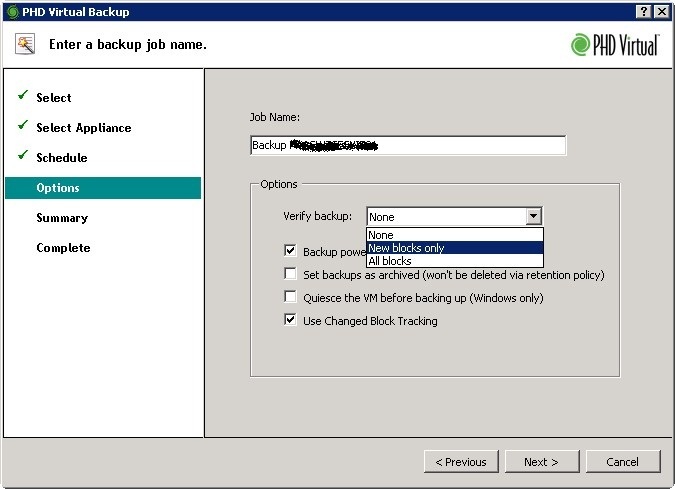 The replicating VBA (that would typically be part of another VMware cluster at a DR site) can mount this backup storage and replicate a VM from it into its own environment. The initial replication can be "seeded" by transporting offline copies of the VMs physically to the DR site (in case there is only a low capacity WAN link between sites). Subsequent replications will only synchronize data that was changed since the last replication and will hence require only little bandwidth. DR replication is a nice add-on of the Virtual Backup product, but the use cases are limited to non-critical workloads, because replication is not done directly, but only from backups. The RPO (Recovery Point Objective) time needed for business critical VMs (less than an hour) can hardly be met with this method. However, most people have already protected such workloads by using different technologies (e.g. online data mirroring, OS or application based clustering), so that they can still benefit from PHD Virtual's DR Replication. 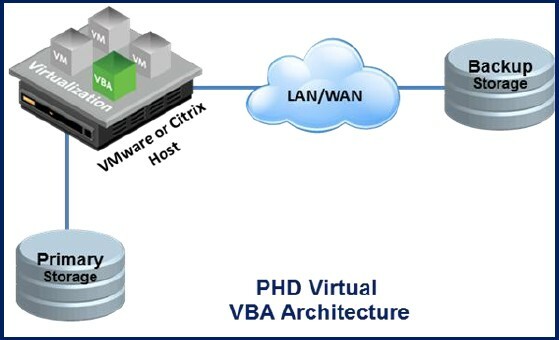 The PHD Virtual Backup product offers a simple, robust and scalable architecture that fully benefits from the virtualization intrinsic advantages (e.g. VMware DRS and HA). It combines an efficient backup data handling with a unique and universal method of File Level Restore. Because of its unlimited scalability it is suitable not only for small and medium business customers, but also for large enterprises. The simple architecture has a drawback though if you need to handle a very large environment with thousands of VMs and dozens of backup appliances: Each VBA needs to be configured and managed separately, and you need to think very carefully about how to distribute all the backup jobs among the VBAs - in the end the backup schedules are static. Wouldn't it be good to have a central management instance that will configure, manage and monitor all VBAs and dynamically orchestrate the backup jobs among them? Wouldn't it be good to have at least programmatic interfaces to third party tools that could potentially overtake these responsibilities? It looks like PHD Virtual is aware of this issue and is going to address it: With the latest version 5.4 of the product they make an API and SDK available that can be used by customers to extend its functionality and integrate it into third party management workflows. PHD Virtual's VMware vSphere Backup and Replication is available for download as a 15-day-trial version. It is licensed per virtualization host (thank God not by CPU sockets ;-)). Purchases can be made through authorized resellers. According to PHD Virtual the API and SDK for the product are available on request to "anyone having a good use case for it".